So, Converse gives you the power to design your own All-Stars, a sure sign that the Apocalypse is still a ways off. And not only can you customize the regular ol' canvas sneaker, but they also provide a patent leather version as a blank canvas on which to paint your footly masterpiece. Can I resist? That would be a "no." Sure, it looks like a bowling shoe. What's your point? By the way, it's always a surprise to people when I show up at a dance wearing All-Stars. They really do make very comfortable dance shoes; the soles have just the right amount of friction, and they don't leave marks on the floor. KC & The Sunshine Band had it right! 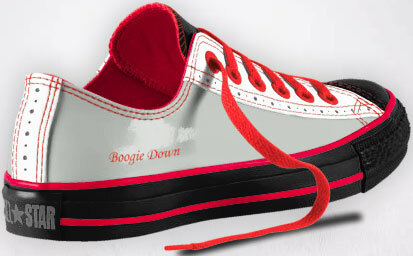 I thought sighting Boogie Shoes, was far more palatable than Boogie Nights. I do well in trivial matters, however the memorization of these particular lyrics is beyond me. One thing I've learned from Pharmacy school over 30 years ago, it's not that you know every minute detail of information, but it is the ability to know where to access those morsels of knowledge. Of course back in the dark ages google was only a term used to define an extremely large number,a computer was a hand held TI 2500 Datamath, and knowing which books of knowledge in the library to seek the answer was limited by the ability to access available cerebral storage. This page contains a single entry by Eric published on February 11, 2012 5:24 PM. "Twin Towns" Casting Call: Pack up the family was the previous entry in this blog. Random Thursday - The Friday Edition is the next entry in this blog.